Playgoers are in for a treat next week when Eoin Colfer’s achingly funny comedy, Holy Mary, comes to the Town Hall on Tuesday, November 13, at 8pm. It is 1986 in Dublin and two young girls are getting ready for their First Communion. Mary and Majella have been sworn enemies since baby infants, and things have got even worse since Mary's daddy moved in with Majella's mammy. Scrambling for insults to fling at each other, Majella thinks she has found a weak spot when she discovers Mary's Communion dress is from the Vincent de Paul. Will Majella use this devastating info to destroy her rival, or realise that she and Mary might not be so different after all? In typical Eoin Colfer fashion the characters are very real and very funny. 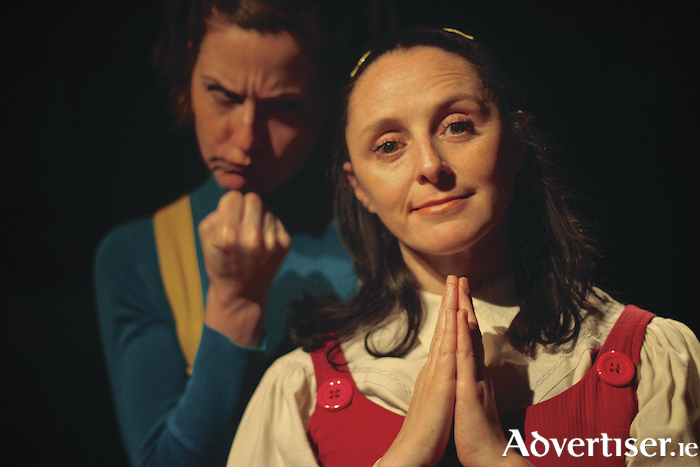 The cast of two, Mary Murray and Jacinta Sheerin, play the girls, their mothers, a benevolent priest, a patient teacher, and a misguided father in a captivating evening of theatre. Holy Mary is directed by Aoife Spillane-Hinks, a graduate of NUIG’s MA in drama and theatre studies and a highly regarded director on today’s circuit.